Jesus is taken to Pilate, who questions Jesus, but Jesus makes no reply. Perhaps Jesus fulfills Isaiah's prophecy in remaining silent; in addition, Jesus has no reason to defend himself before Pilate or anyone else for that matter. He is accused of treason. In one sense, this may be a false accusation, since he has no interest in leading a revolt against Rome. Yet, anyone who proclaims the coming of God's Kingdom threatens the powers that be in this world. In one sense, Pilate may see Jesus as no threat; in another sense, he brings into question any who rule apart from God's reign. In keeping with his Passover custom, Pilate is willing to release Jesus if the people desire. It is entirely possible that Pilate would like to see Jesus freed simply to "stick his finger in the eye" of Caiaphas, whom Pilate despises. But the crowd wants nothing to do with Jesus. Perhaps the many who had followed Jesus have come to realize that the liberation he offers will leave Pilate in charge. If Jesus refuses to be the Messiah they desire him to be, it is better to release Barabbas; someone who, in brigand-like fashion, has demonstrated in no uncertain terms what he is willing to do in order to "liberate" God's people. "Crucify him!" Crucify him!" The crowd shouts in a fashion that echoes through the centuries, speaking for all who have sinned and fallen short of God's glory. And although Pilate would like to be exonerated of his complicity, he too is also responsible for Jesus' death. No one is innocent. Once Pilate hands down the order for Jesus' death, the guards, more-than-expertly trained in the gruesome art of crucifixion, take over. There are no rules laid upon them. There is no debating as to what constitutes torture. The only thing they need to make sure of is that they do not kill Jesus before he can be nailed to the cross. The Romans want to make sure that the people witness Jesus' fate in order to deter others from leading a band of revolutionaries. In leading Jesus to Calvary, he is simply not capable of carrying the cross-beam to the hill of his death. They enlist a passer-by, who is simply minding his own business, to carry the cross for Jesus. How true it is that a chance encounter in life can change a person forever. 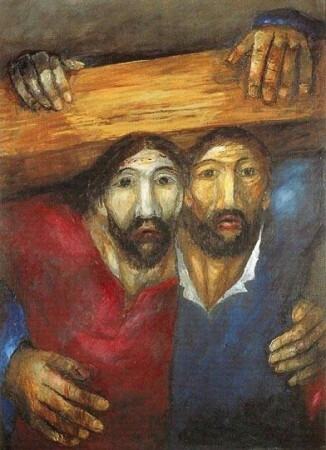 We know nothing of Simon of Cyrene, other than the fact that he was coming into Jerusalem from the country. What we can perhaps surmise is that somehow this unexpected event for Simon transformed his life; for the Gospel of Mark connects Simon to his sons, who were known by Mark's audience. Perhaps Alexander and Rufus were followers of Jesus because their father, Simon became a follower of Jesus. As Jesus hangs upon the cross, the people say, "He saved others, but he can't save himself." This is not a surprise to those who truly know Jesus. It would be impossible for Jesus to save others if he did save himself. He tried to tell his disciples, and all would listen to him, of the sacrificial nature of God himself. But since they cannot understand what it means to lose one's life in order to find it, they simply resort to hurling insults upon him until he dies. Joseph of Arimathea approaches Pilate asking for Jesus' body. Perhaps Pilate grants the request as one more way to "stick his finger in the eye" of Caiaphas. Instead of throwing Jesus' body to the dogs by the side of the road, or leaving it on the cross to be fodder for the birds, Pilate permits Jesus a proper Jewish burial. No doubt, Caiaphas was not happy about this, but then Pilate had willingly done Caiaphas' dirty work. Why should Pilate care, at this point, what the high priest thinks? Great article and I love that imagery!